The finalists for the 2010 World Mayor Prize were chosen on the number of nominations received and, more importantly, on the persuasiveness and conviction of supporting statements. Below we publish a representative selection of comments received about Cory Booker, Mayor of Newark, NJ, USA. Comment: Mayor Booker is more than a political mayor. He's inspirational,very approachable, and very hands on! The City Mayors Foundation, the international think tank on urban affairs, organises the World Mayor Project and awards the World Mayor Prize. The Prize, which has been given since 2004, honours mayors with the vision, passion and skills to make their cities incredible places to live in, work in and visit. The World Mayor Project aims to show what outstanding mayors can achieve and raise their profiles nationally and internationally. Mayors wishing to be considered for the Prize are asked to sign up to the City Mayors Code of Ethics. The organisers of the World Mayor Project are looking for city leaders who excel in qualities like: leadership and vision, management abilities and integrity, social and economic awareness, ability to provide security and to protect the environment as well as the will and ability to foster good relations between communities from different cultural, racial and social backgrounds. 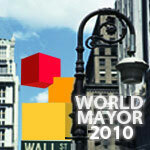 Winners receive the World Mayor Prize, while the first and second runners-up receive the World Mayor Commendation.